We are back to semi-civilization after our second field data collection trip up into the alpine. This time the adventures and challenges were of an either furry, wet or buzzy nature. 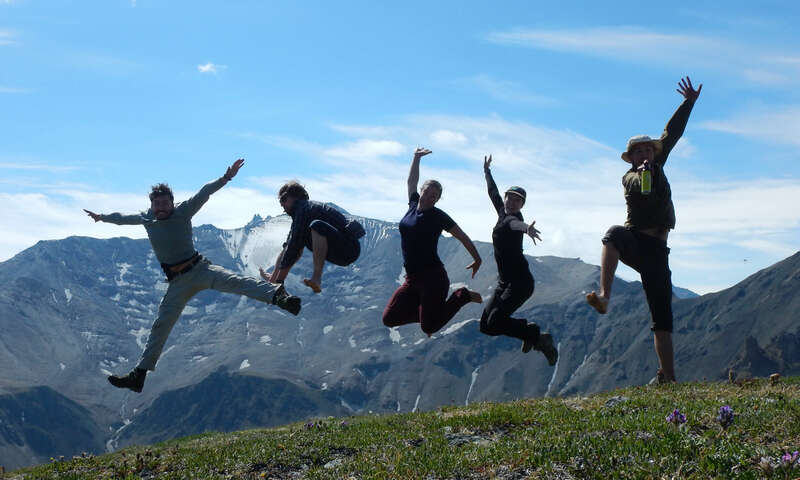 Our latest epic jumping shot from the top of the Kluane Plateau. Our first challenge appeared just as we were getting ready to head for bed on the first night. Haydn saw something blond and furry ambling around in the tundra a few hundred metres from our camp. It was what looked to be an adult male Grizzly bear that we called Jean-Pierre. We watched Jean-Pierre’s reactions to our presence and he seemed pretty relaxed, yet wary of us. With our food well cached far away and our tents close together, we felt it was safe to head to bed with our neighbour continuing his foraging into the night. 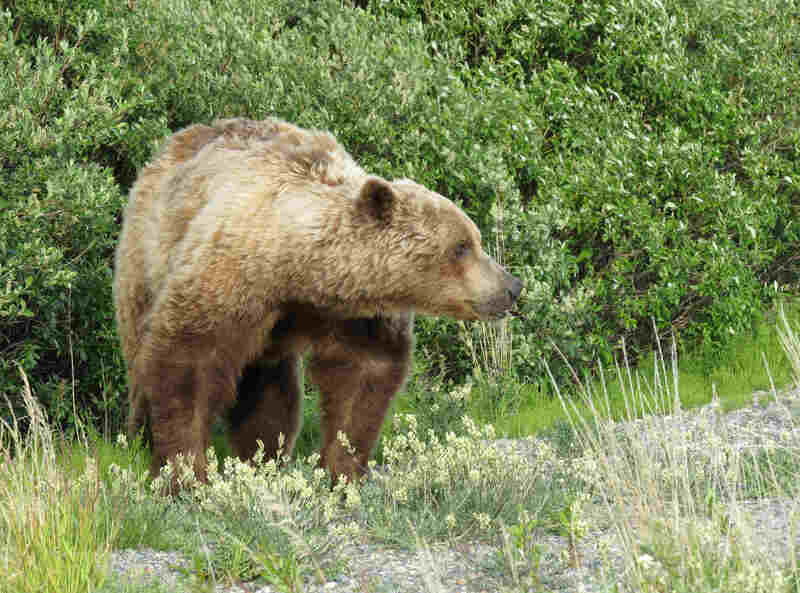 A grizzly bear from the 2014 field season that looks a lot like a smaller and more svelte version of Jean-Pierre. The next challenge was the day of rain that slowed down our progress. We tried to sleep in until the rain stopped, but the rain kept raining. So we made our breakfast in the drizzle, which reminded us all of truly Scottish weather, and then headed out for some field data collection. After a couple of hours, the wet was starting to seep through our rain gear, down our necks and up our sleeves and we were starting to get pretty cold. So we returned to camp and to our tents. The boys played games of cards in very cramped conditions, and some of us read books if we had brought them along, whereas I just rested my eyes. I haven’t got that much sleep over a 24 hour period for years! 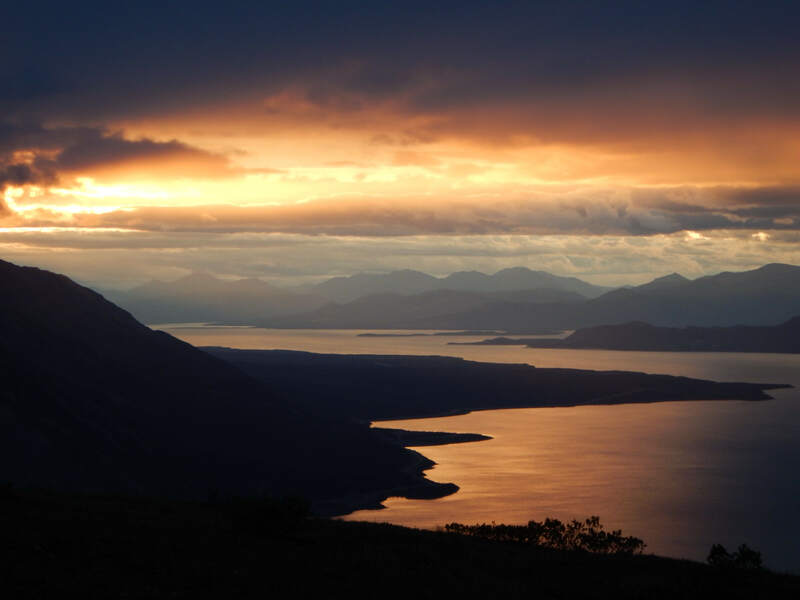 The Sunset after the storm from our camp on the Plateau. The final challenge of the Kluane Plateau was the bugs. Once the rain had cleared and the sun returned, the normally stiff alpine breeze was absent and this meant mosquitoes. For the following day, there was a persistent humming in our ears, flies in our food and itchy bits on any exposed skin – we are still itching away. One member of our team, Joe, has decided to be truly epic (or possibly foolish) and to go without bug spray. The rest of us were only too happy to spray on some temporary relief from the insistent clouds of biting insect at every opportunity. (Don’t tell the rest of the crew, but the number of bugs that we were experiencing up on the Plateau was nothing to what we could encounter when we get up to Herschel!). Dinnertime at sunset (11:30pm at night) after the rainy day. Look how happy we look now that the rain is gone! After four days of sample collecting and adventures in the alpine we made our way back down to “Base” (a.k.a. The Kluane Lake Research Station). 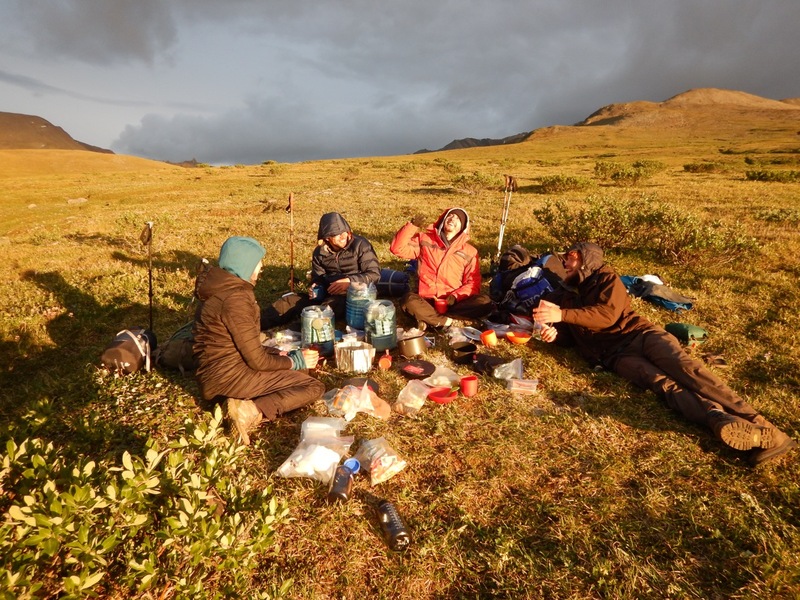 But before leaving our temporary home on the Kluane Plateau we decided to summit the ridge as a group to take a last look at the panoramic views of snow-capped mountains and a glacial-fed lake (positively limnic!). As we reached the summit, we felt true “Tatenfreude”, the joy in anticipation of accomplishing something (or as Isla likes to think of it “Tartan-freude”, the joy that people from Scotland feel when they accomplish something). 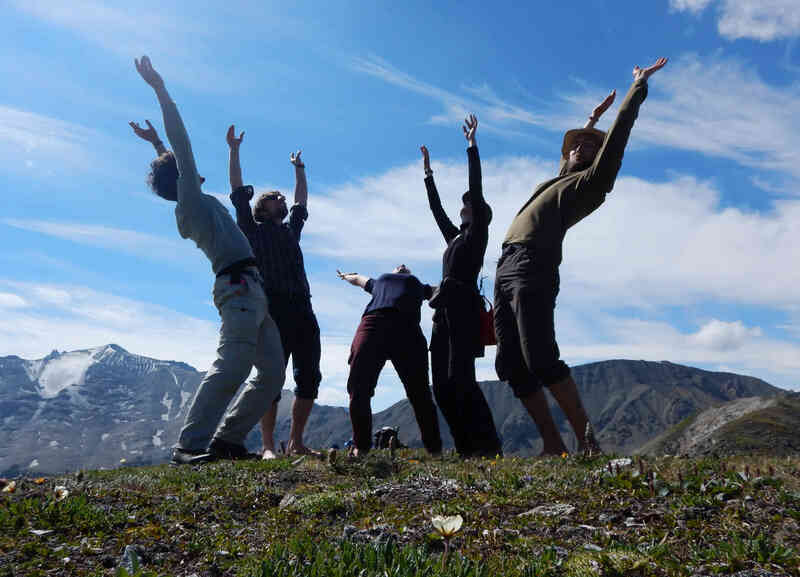 The exploding high five from Team Shrub at the top of the Kluane Plateau. P.S. Our major scientific finding of the week is that willow (Salix pulchra and Salix richardsonii) seed germination rates can be very high when the catkins are freshly picked of the tundra shrubs. Check out these SUPER CUTE baby willows! 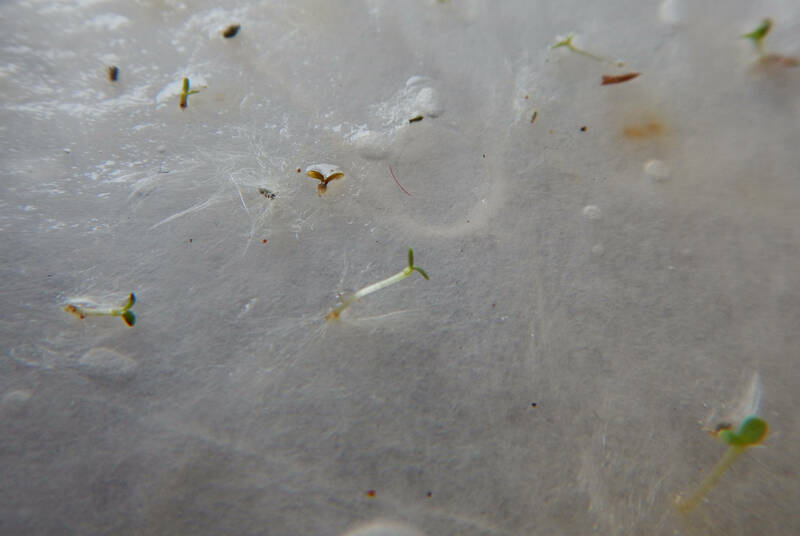 Baby willow seedlings only a few days old – how sweet! Sigh.